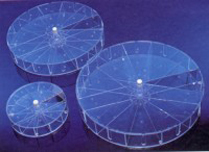 PIE CAGES for mouse and rat Circular cages hold up to 10 mice or 11 rats. The notched removable lid can be dialed to any of the ventilated pie- shaped chambers. These units were originally designed for whole body irradiation. Use for temporary transport or storage of animals for acute studies. The rat cage has tail slots for intravenous dosing. The mouse unit is 21.5 cm in diameter and 7.5 cm in height; individual chambers are 5 cm (base) and 9 cm (length). The small rat unit is 41 cm in diameter and 6.75 cm in height; individual chambers are 10 cm (base) and 18 cm (length). The large rat unit is 46 cm in diameter and 8.0 cm in height; individual chambers are 11.5 cm (base) and 20 cm (length). Disposable Restrainer for mouse and rat Make injections and decapitations quicker and easier with this Coneshaped restrainer. These tapered plastic film tubes provide quick and easy restraint of rats, mice and other small animals. I.P. injections can be made directly through the film! Cones restrain post-decapitation kicking and prevent personal contact with faeces and urine. A unique dispenser holds Cones open and ready for use. Simply hold the Cones in one hand and introduce the animal with the other. Animals enter readily, heading for the breathing hole at the small end. Then you simply roll and squeeze the large end closed. They may be used repeatedly for injections and simply discarded when soiled. For decapitation, hold at the rear and insert the small end into the decapitator. Rat Snuggle The "SNUGGLE " uses the principle of a cocoon rather than a rigid structure for immobilization. The multiple flaps perform two functions: They are adjustable around the subject for effective yet comfortable restraint, and positioned, or left open for access depending on the procedure. Both restraint and procedure can be carried out by one handler. The "Snuggle" is manufactured from flexible yet extremely durable canvas fabric. The fabric is coated with nylon to facilitate laundering for reuse. Wide flaps with velcro fasteners allow for maximum flexibility, ease of use and adjustment for fit between individual subjects. For more information follow this link.